A major report cites obesity as a cancer risk factor that one co-author says causes nearly as many cancer deaths as smoking. 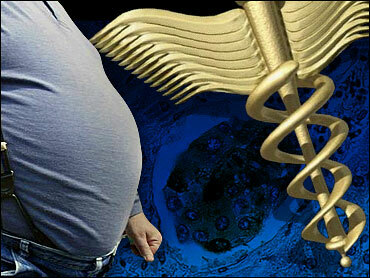 Another co-author calls the obesity-cancer link the report demonstrates "remarkable." The report, "Food, Nutrition, Physical Activity, and the Prevention of Cancer: a Global Perspective" is an "eye-opener," Early Show medical correspondent Dr. Emily Senay said as it was released Wednesday. It shows that the connections between lifestyle choices and cancer risk are clearer than ever, she said. The 500-page document, which took five years to compile, analyzed more than 7,000 clinical trials and was put together by the American Institute for Cancer Research and the World Cancer Research Fund, and includes contributions from scientists at Harvard, the National Cancer Institute, and many other institutions worldwide. Authors call the report "the most comprehensive ever published on the evidence linking cancer risk to diet, physical activity and weight." "It's all about prevention," Senay said. " ... It's an eye-opener report" that shows the evidence "is clearer than ever. Even small amounts of excess body fat, especially around the middle, can make cancer more likely." Report co-author and London-based researcher Dr. W. Philip James told CBS News, "This is the first report that clearly shows that the fatter we are, the greater the risk of cancer. It's remarkable how clear that link is." James says that, as obesity rates soar, the list of cancers associated with those extra pounds is growing: "Breast cancer, particularly post-menopausal breast cancer, cancer of the large bowel, and cancer of the pancreas, those are the three big ones." Another co-author, Dr. Walter Willett of Harvard, told CBS News obesity is now "approaching smoking as a cancer risk," and Senay says it could surpass smoking one day. The report also cites red meat as a big cancer risk raiser. The researchers say 18 ounces - barely more than a pound - is all the red meat a person should eat in a week. "It is quite clear," James says, "that, if you're in a country where a lot of red meat is eaten, that's where you find people getting more large bowel cancer." Other things to limit include alcohol, salt and sugary drinks. Senay points out that, in addition to the list of things not to do, there are things we should do, such as eat plenty of fruits and vegetables, and get plenty of exercise - at least a half-hour a day. Also, the report notes solid evidence that breast feeding does more than nourish a baby. "It's very striking," James says, "that, if mothers breastfeed, they really do reduce their risk of breast cancer. We've known for years that the baby profits. But now, there's no doubt at all that it's not just the babe, but the mother, as well. Death rates from cancer have been dropping in recent years, Senay notes, and suggestions in the report could point the way toward even fewer cases of cancer, and fewer deaths. "These are all recommendations you've heard before," Senay observes. "All this links back again to obesity as such an important risk factor. What's different about the message now is how much it appears to matter not just for your heart, but also for your risk of developing cancer." Senay added that the report shows people can go a long way toward offsetting genetics as far as their cancer risk is concerned: "Relatively few" cancer cases are in the genes. "One of the most interesting things in this report is an estimate that only 5 to 10 percent of cancers result directly from genes that we inherit from our parents. There is much we can do to reduce our risk. Most cancers occur when genetic material inside our cells is altered or damaged over time. To the extent that diet, nutrition and physical activity can influence those cellular changes, the report says that making those lifestyle choices can make a positive difference." The report also cites body growth rates as possible cancer risk factors. For instance, it notes evidence that tallness, and high-birth rates in females, could increase cancer risks. To see summaries of major sections of the report, click here.